Our Crease & Tear resistant PTFE coated fabrics are manufactured from woven fiberglass substrates and have the highest tear strengths of any of the PTFE coated fabrics yet still retains a high flexibility. 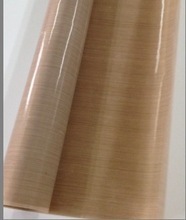 This PTFE coated fabric is also the strongest and most durable of any of the PTFE coated fabrics. Available in standard thicknesses of .003″, .004″, .005″, .006″ & .010″. Higher mil thicknesses are available. Typical applications would be high speed packaging belts and edge reinforcement for industrial belts.